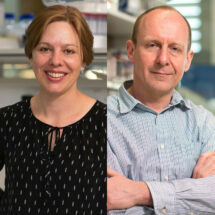 Lori Passmore, group leader in the LMB’s Structural Studies Division, and Felix Randow, group leader in the LMB’s PNAC Division, have been newly elected as members of the European Molecular Biology Organisation (EMBO). Founded in 1964 to promote molecular biology in Europe, EMBO elects new members annually on the basis of scientific excellence and outstanding research contributions. The organisation promotes excellence in life sciences by supporting talented researchers, and stimulating the exchange of scientific information. EMBO membership is a life-long honour and Lori and Felix join more than 1700 of the best researchers from Europe and around the world. 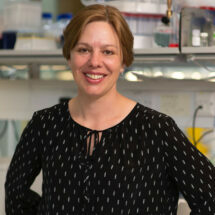 Lori’s research aims to understand the molecular mechanisms of key protein complexes. Her main area of biological interest is gene expression and how this is influenced by poly(A) tails of mRNAs. Poly(A) tails are deregulated in a number of diseases and they play a critical role in mRNA stability. Lori’s lab isolates the cellular machines that control poly(A) tail length, then studies their activities and structures to understand their mechanisms. Her lab also recently developed new specimen supports for electron cryo-microscopy (cryo-EM), including gold and graphene supports that improve image quality, facilitating structure determination of difficult proteins. Felix’s research focuses on the ability of individual cells to defend themselves against infection. The cytosol of mammalian cells is rich in nutrients and is therefore a potentially ideal breeding ground for bacteria. Felix’s group aims to understand how cells succeed in defending their cytosol against most invasion attempts, and how professional cytosol dwelling bacteria outwit cellular defences. 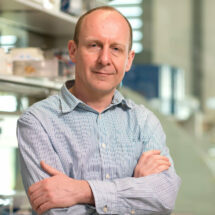 His group is particularly interested in the danger receptors that detect breaches in cellular defence, and in the ubiquitin system that marks invading bacteria as cargo to be destroyed. In addition, defence against pathogens requires profound changes in gene expression and Felix’s group are studying the NF-kB and IRF signalling pathways which lead to such changes.